I love the places our imaginations can go when we have unlimited supplies of cookie dough, icing, and candy. 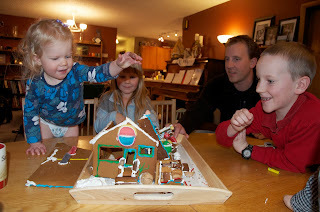 For years, I've been making gingerbread houses at Christmas time; first on my own, and then with my children, who have become more and more involved as the years go by. When I was younger, I remember sitting and staring at the final product, imagining that I was a tiny person walking through the structure, taking the odd nibble of a door-frame or lick of a window pane. Fairy-tales played out in my head while I sat and gazed, and I'm sure my mother was happy for the peace and quiet. Over time, gingerbread house creation became one of my favourite Christmas traditions! Finding a gingerbread recipe that is firm enough to create a beautiful and sturdy house, but also pliable and tasty enough to actually enjoy eating, was a challenge! The recipe that Canadian Living printed over 20 years ago was a keeper, though, and I've been using it for 10 years now. Isn't it great to find something you love so much that it becomes a necessary tradition? When you use this recipe, you will be that person who doesn't just chuck the rock-hard and tasteless cookie at the end of the holiday season. You will find a way to enjoy it even after it has sat out for a while! After the candy is gone, why not consider making a trifle involving gingerbread, or maybe a cheesecake with a crushed gingerbread crust.... The options are endless. When you have something as good as this, please don't throw it out! 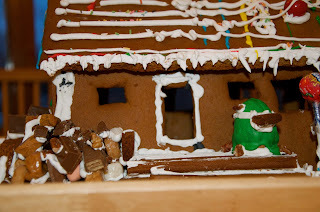 Here is the one from last year, when the kids said, "Let's build OUR house!" The dimensions weren't perfect, but it was really fun to try to create a mini version of our home. 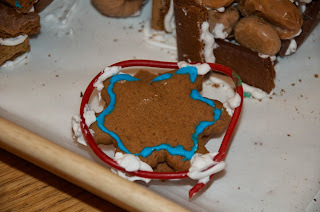 Ir really became the kids' creation after the basic cookies were glued together. They wanted the front steps, the woodpile, a snowfort, the trampoline, BBQ, Christmas lights, the whole nine yards. The woodpile to the left of the deck, with Daddy's Big Green Egg grill on the deck. And another BBQ to the right of the deck, this one with some "steak" on it (pecans). And the trampoline in the front yard. The whole project took quite a while, and the results were far from 'perfect', but they were magical just the same. 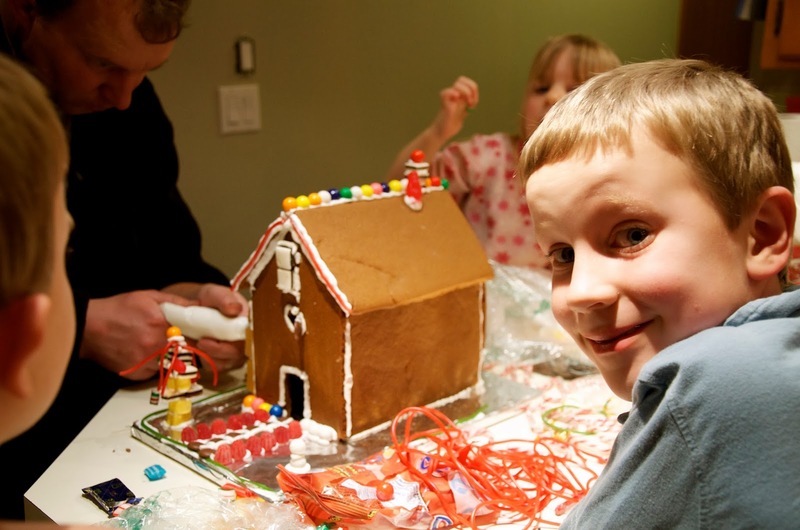 The involvement of the whole family is really what takes it from just-another-Christmas-project to something really special. 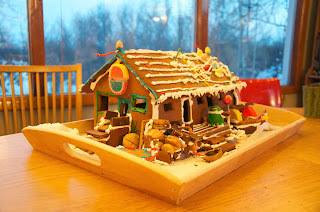 In our home, the tradition has emerged over time to have a "Gingerbread House Demolishing Party" on January 6, which is the Feast of the Epiphany (the visit of the Wise Men to the Child Jesus). That's the date that I clean up the last vestiges of Christmas, and we close the day with hot chocolate and the sugar rush of eating a whole bunch of candy. Don't be traditional - be creative! and then tackle something larger. 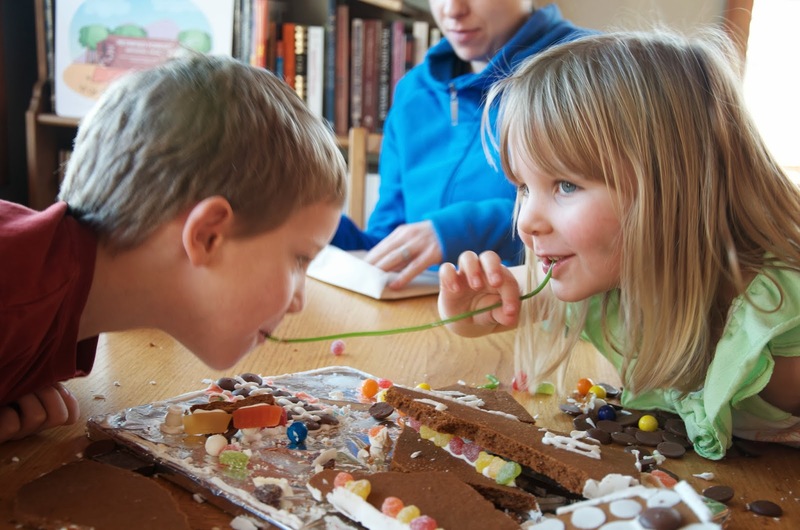 Use icing to drip "icicles" off the roofline. Use a foil covered chocolate coin to make a clock, with a little bit of added icing and some nonpareils. If you're not planning to actually eat the candy, then why not use leftovers from Halloween? We've done it! 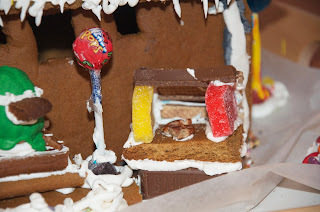 You can use cheap and tasteless candy - as long as it's colourful. Speaking of colourful - divide your plain royal icing into different bowls and stir in paste food colouring (it's the most intense colour and it won't water down your icing), then use this for your decorating. It doesn't have to be candy! You can decorate your house with pretzels, cereal, etc - you could make a thatched roof out of shredded wheat, or make shingles from Cinnamon Toast Crunch. Decorate your gingerbread house on a piece of cardboard coated with tinfoil - then it's easily portable. 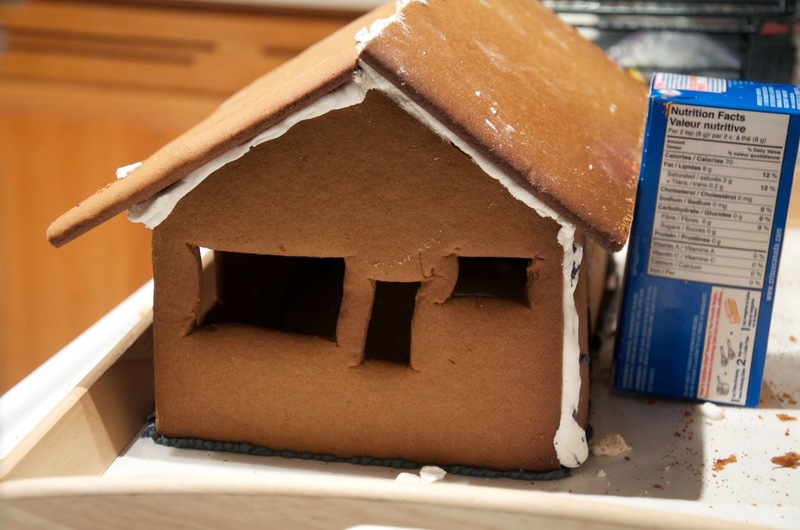 Further to that, cut a hole in the cardboard under your house, so that you can later set your gingerbread house up on a wrapped box and poke some Christmas lights up into the house - what a great way to show it off! This is the original gingerbread house recipe from Canadian Living's December 1990 issue, and it is my failsafe for all of our gingerbread creations over the years. It makes a lot of dough - enough for one large gingerbread house or 5 small ones! My note on the recipe card says, "For goodness sake, don't triple it." In large bowl, beat shortening with sugar until light; beat in eggs and fancy and blackstrap molasses. Roll out the dough between two sheets of waxed paper. When you have it at 1/4-inch thickness, remove the top sheet and cut out your pieces using the tip of a sharp knife. To avoid having the pieces puff out on the edges, you can freeze them on waxed paper-lined baking sheet for 20 minutes or until hard. Otherwise, you will need to trim the final cookies before assembly. Transfer cutouts to parchment paper-lined or lightly greased baking sheets, reserving dough scraps for re-rolling into other gingerbread shapes. Bake at 325 F for 12 to 15 minutes or until golden and firm to the touch. Transfer gingerbread to racks and let cool completely. In a large bowl, beat water with meringue powder until foamy, about 2 minutes. Beat in icing sugar, 1 cup at a time, until stiff peaks form when beaters are lifted, about 4 minutes. Cover with damp towel to prevent drying out. 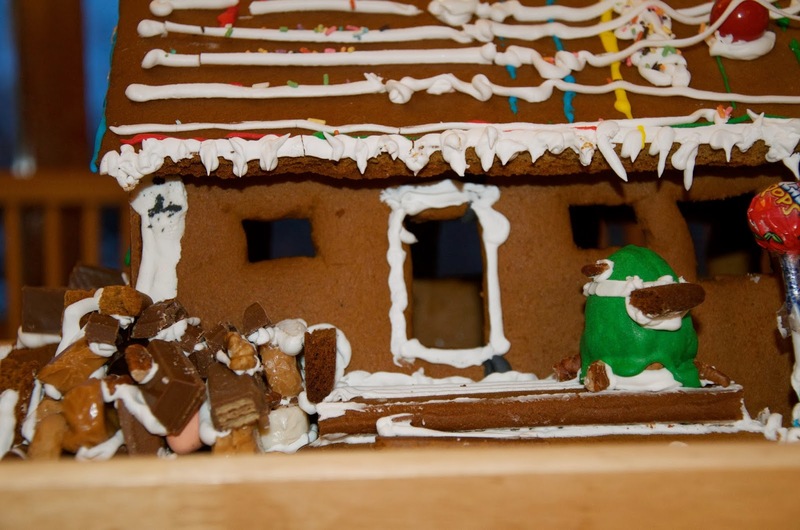 This stuff gets as hard as rock, and it will definitely keep any crazy gingerbread house together.